S.T.A.R. 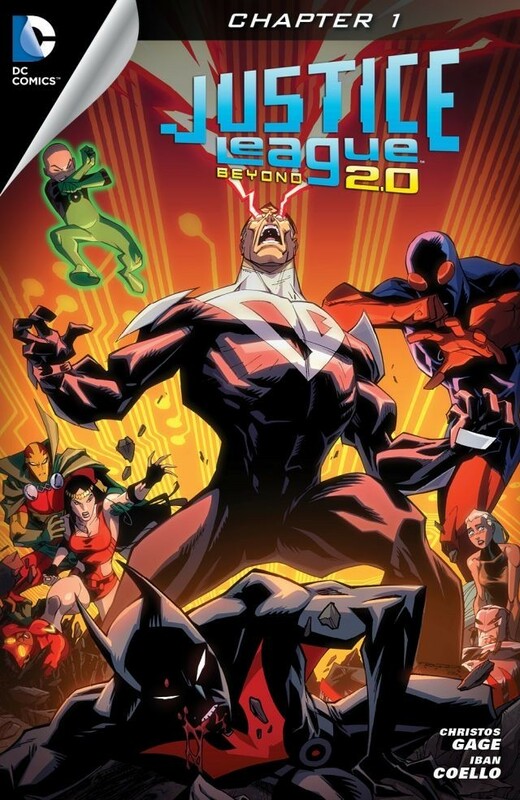 Labs is under attack by the Nanodemons, but their actions are quickly interrupted by the arrival of the Justice League Beyond (JLB). The Nanodemons reveal that their attack was a ruse to draw out the JLB, and use their powers of possession to turn Barda and Micron. Superman arrives and dispatches them all, but in trying to help the Flash, he realizes that his powers are surging and making him a potential threat. Batman (Terry McGinnis) explains that something impacted with the sun, altering its solar energy and increasing Superman's powers. Superman asks Bruce Wayne for advice, and attempts to discuss why Bruce is no longer advising Batman. Bruce ends the call and Superman seeks to gain control over his powers. He trains with Warhawk to master his flight, meditates with Green Lantern (Kai-ro), races against the Flash (he wins! ), and spar with Barda, but with no helpful results. Captain Marvel returns from visiting Shazam, and tells Superman that there is no magical solution to the problem, but as he informs Superman of this, a blast of heat vision sears a nearby Aquagirl, leaving Superman and Captain Marvel in shock at what has transpired. Story - 4: It's amazing that this version of the Justice League has lasted so long. When they debuted on Batman Beyond, they came across as "Cap's Quirky Quartet" no less. However, the team comes across as fully formed in this issue, especially with the additions of Captain Marvel and the Flash. Their respective characters are given light but sufficient rendering, and everyone gets their moment, although Aquagirl's is life-threatening. That Superman is the focus of the opening storyline is also to the title's benefit, since he can be the star and a foil without losing a step. There's also a familiarity to JLB 2.0, and this is issue #1, which is helpful in encouraging a reader to return for the next installment. What the story does suffer from is the same familiarity that makes it inviting. In a one year span, how many stories has Superman featured in, where he's killed or nearly killed someone? Injustice, Trinity War, Man of Steel, and now he sets Aquagirl ablaze. The shock value garnered by seeing Superman inflict death or near-fatal injury to someone is quickly becoming Silver Age Kryptonite, with the Gold Kryptonite version being Superman performing seppuku. Ironically, seeing Superman do deadly harm to someone only works if you believe he's a character who should not do deadly harm to others. It's an action that's at odds with the character, and a plot device that needs to be put to bed for a while, if not for good. The same can be said for Superman's powers being out of sorts due to how he processes solar radiation. It smacks of All Star Superman, and it will all ways smack of All Star, which is a good reason to not use it. Still, hackneyed or not, it allows for Superman to take center-stage, which, if you were a fan of Superman Beyond, makes for an easy transition into reading and enjoying JLB. It's almost embarrassing to admit that the issue gets a high rating because it was fun and Superman looks cool, but that's about the size of it at the end of the day... though I do wish they would change his costume. The black is such a mourning look, and while it doesn't have to be the classic, something with a wee bit of color wouldn't be anathema to what has been established. Art - 3: It's suitable but still inconsistent. In some panels Superman looks like a weathered brawler and in others an emaciated geriatric. It's a weekly comic, that's understood, but it would great to see high quality art turned in nonetheless. Cover Art - 3: Again, like the story, familiarity is the double-edged dealer. It's a great shot, but is it possible to show Superman angry or out of control without glowing red eyes? The color splash almost had me believe that his costume colors were changed as well.